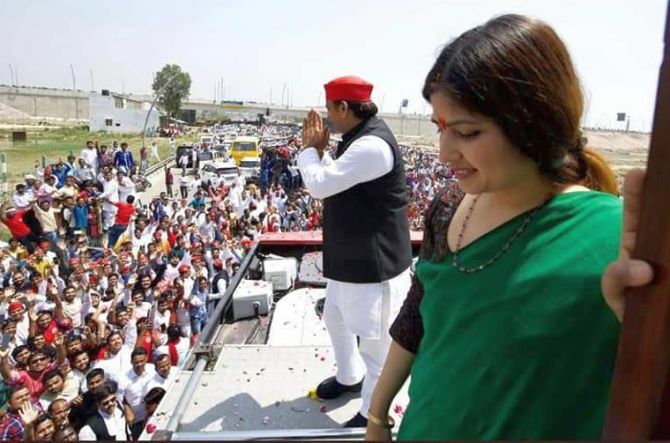 Samajwadi Party leader and sitting Member of Parliament Dimple Yadav on Saturday filed her nomination from the Kannauj parliamentary seat. 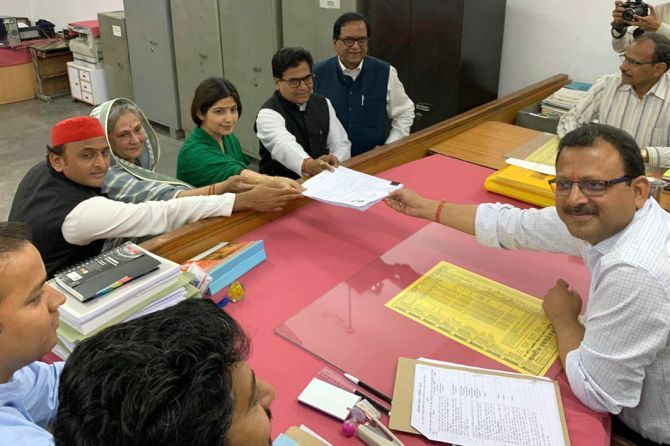 Dimple filed the nomination in presence of her husband and Samajwadi Party chief Akhilesh Yadav, who is contesting from the Azamgarh constituency in the polls. The SP leader Ram Gopal Yadav, Rajya Sabha MP Jaya Bachchan and Bahujan Samaj Party leader Satish Chandra Mishra were also present. "The victory margin will be huge since there is an alliance between Samajwadi Party-Bahujan Samaj Party. Bharatiya Janata Party did not fulfil its promises and now to divert attention, it is using the security forces. It has been a failed government," Dimple Yadav said. Talking to media, Akhilesh Yadav said, "Dimple will take the legacy of Samajwadi Party forward. In Kannauj, the SP has done great in the past and this time it will do better." Hitting out at BJP, Yadav said, "BJP has been stopping the path of development that was made possible with Lucknow-Delhi expressway built by Samajwadi Party. BJP never fulfilled its promise, it only spread hate amongst people and divide them on based on caste, he added. If BJP calls 'Mahagahthbandhan' a 'Mahamilavat', then what can be said about NDA which has more than 30 coalition partners," asked Akhilesh. On the question of Uttar Pradesh Chief Minister Yogi Adityanath calling Muslim league a virus, Akhilesh said, "The UP chief minister does not know how to use Twitter and it seems there must be a virus living with him these days which is spreading these kinds of statements from him." Dimple Yadav has represented the Lok Sabha seat from here since 2012 when it was vacated by her husband, who had become the chief minister. She was first elected unopposed from Kannauj Lok Sabha seat in the bypoll in 2012, which was necessitated after Akhilesh Yadav, who was also elected from Firozabad, quit the Kannauj seat. She was re-elected from Kannauj in the 2014 Lok Sabha election. Polling for the Kannauj Lok Sabha seat will be held in the fourth phase on April 29. Seven-phase elections in the country are slated to begin on April 11 and will go on till May 19. Counting of votes will be held on May 23. There are 80 Lok Sabha seats at stake in Uttar Pradesh, polling for which will be held in all seven phases.